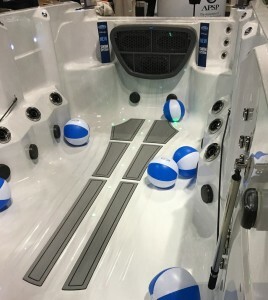 Coast Spas® Manufacturing Inc has unveiled a new Swim Resistance System (SRS), they believe will revolutionise swim spas and set raised standard for the industry in this growing swim spa sector. The new SRS will be available on all of Coast’s 2018 Wellness Swim Spa models. Developed by Coast Spas and engineered to be the most effective counter-current swim machine available, the new system is able to quickly move large amounts of water in an incredibly smooth and non-turbulent manner that creates the perfect swimming environment. All this is coupled with a new variable speed control system that allows swimmers to select the perfect speed of counter-current and a new touchscreen interface that offers users to select multiple exercise modes and access various pre-set selections tailored specifically for their ability. Each model is loaded with features that allow the user to get the most from their Wellness Spa® such as premium underwater exercise bands that have integrated quick-click attachment points located in various areas of the spa to accommodate a large range of upper-body and core exercises. In each model there is also a seat and connection points for two underwater row-bars. The Wellness Spa® takes rowing to the next level by adding a resistance band to the bars in order to optimize the user’s output while performing this incredibly effective exercise. The Wellness Spa® Swim Spa, say Coast, is the definition of taking hydrotherapy, health and fitness to the next level. UK Coast Spa distributor Mark Anthony said: “Coast have invested heavily in wellness this year and have many innovative additions for next year. Mark revealed the Coast Spa innovation came as a result of a dealer meeting of Coast’s President’s Club; involving all worldwide dealers who sell over 300 spas a year. “It’s so refreshing that Coast listen to retailers,” Mark comments. “The ideas and suggestions of these dealers have been implemented in the 2018 product offering and has helped create exciting times for all Coast Spa sellers.